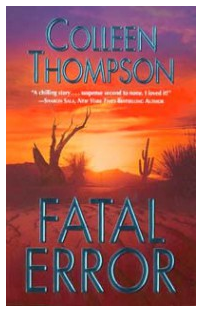 This book is listed as Romantic Suspense. I found it to be more suspense than romantic. My heart pounded, I jerked in surprise and put the book down several times just to catch my breath. I've been reading a lot of small town romances and ended up falling in love and wanting to move there. This book didn't give me that feeling. I thought it was a great example of what can go wrong in a small town. The Sheriff who has been in office for too long. The Ladies Group that basically runs the school board. The narrow-minded and petty people that show up everywhere, just in larger number here. The Mother in denial and looking to blame anyone else for her son's behavior. There are also the two ladies who have been friends with her Mother forever and always come through in a pinch. The almost high school drop-outs with redeeming qualities. The brother-in-law who does what is right. The sister who comes through in the end. The imagery used to describe the beauty of the wasteland surrounding the town made me think I was there. His gaze rose to where, far above the sky-stretched arms of ocotillos, a buzzard floated kite like on the breeze. The dark bird glided toward the distant purple smudge of foothills, its apparent aimlessness a study in deception...he opened his hand and let the hot breeze carry the feathers away. It skimmed along the sand until the lost sight of it among a thorny mass of cholla cactus. The imagery isn't just for the location, it works very well with the characters too.
. . . he had failed so utterly that she would never see him as more than a ... loser, a vindictive ... who'd struck out at her like a toddler in a tantrum. Screaming with rage at hte thought, he swept the photos and the papers off the table, his wrist smearing a bloody arc across its cool tiled surface. It looked almost like a sunset, he thought in the last moments before his intolerable. existence flickered and went out. I enjoyed this one very much and am looking forward to reading more of her books but due to space limitations, I'll use the library. West Texas gossip paints every story a more interesting shade, especially when a married man goes missing with a small-town banker’s wife and a stolen fortune. Susan Maddox is tired of feeling like an abandoned woman, and even angrier when neighbors insist she’s the one getting away with murder. Maybe her handsome-as-sin, bad-boy brother-in-law isn’t the smartest choice of an ally, especially since she’s never been able to forget a star-studded night in his convertible back in high school. But who else can she trust to recover damning information from her husband’s crashed hard drive? Who else can pick up the pieces when intruders set fire to her home, a truck runs her off the road, and a trail of dead men stops her cold? Who else will help her uncover a fatal error?